JERUSALEM (CNN) -- Israeli airstrikes on Gaza continued for a fifth day Wednesday, as the Jewish state's defense minister mulled a truce proposal to allow humanitarian aid into Gaza. 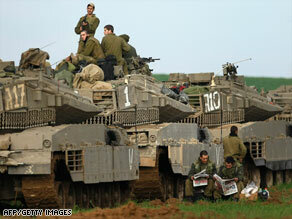 A column of Israeli armored vehicles is deployed in a farmer's field Tuesday near the Gaza border. The air assault overnight into Wednesday struck the office of Hamas Prime Minister Ismail Haniya and the Hamas Interior Ministry, among other targets, the Israeli Defense Forces told CNN. The airstrikes followed a mission Tuesday that leveled at least three buildings in a Hamas government compound. The Israeli air force also blasted away at a series of tunnels linking Gaza to Egypt through the Rafah crossing. Meanwhile, Israeli Defense Minister Ehud Barak was considering the truce proposal -- originally raised by French Foreign Minister Bernard Kouchner -- and would bring it to Prime Minister Ehud Olmert for consideration, a Defense Ministry official said Tuesday. However, Israeli Defense Forces denied earlier media reports saying it would advise Olmert to adopt a two-day truce. Israeli daily newspaper Haaretz had reported "the goal of the temporary calm would be to see if Hamas can abide by the truce and cease firing rockets at Israel." Kouchner called Olmert Tuesday afternoon about the proposal, French Foreign Ministry sources said. France, which holds the rotating European Union presidency until Thursday, had brought together foreign ministers in Paris to address the situation in Gaza and in southern Israel. French President Nicolas Sarkozy's office said Israeli Foreign Minister Tzipi Livni will meet Sarkozy in Paris on Thursday. The Israeli military says it was targeting only Hamas militants, blaming them for rocket fire into southern Israel. Meanwhile, U.S. President George W. Bush called Palestinian Authority President Mahmoud Abbas and Prime Minister Salam Fayyad to discuss a "sustainable cease-fire," White House spokesman Gordon Johndroe told reporters in Crawford, Texas. And the Middle East quartet -- comprised of the United States, the United Nations, Russia and the European Union -- conferred on a conference call about the situation. However, Gaza is controlled by Hamas -- considered a terrorist group by Israel and the United States. Neither will negotiate with Hamas leadership, which seeks an Islamic fundamentalist Palestinian state. A Hamas spokesman said he didn't consider a temporary truce feasible now. "There is nowhere to talk about just the 48-hours cease-fire," Hamas spokesman Osama Hamdan told CNN's "Situation Room" on Tuesday. "We have to talk about an end for this attack, Israeli attacks against the Palestinians and opening all of the borders for the Palestinians to have aid -- either medical aid or another other kind of support -- and then we can talk about the politics." The United Nations has called for both sides to end the violence, and U.N. Secretary General Ban Ki-moon has roundly condemned both sides: Hamas for the rocket fire and Israel for its "excessive use of force" in retaliating. Despite the rumblings on a potential truce, Olmert warned earlier Tuesday the airstrikes were only the beginning of a wider military operation, telling Peres, "We are currently at the first stage of the operation," Israeli government officials said. Among the dead were two girls, ages 4 and 11, who were killed early Tuesday, as they rode in a donkey-driven cart in Beit Hanoun, sources said. On the Israeli side, three civilians and a soldier have been killed in rocket attacks from Gaza on southern Israel since the campaign began Saturday, military officials and police said. "They are committed to our destruction," Former Prime Minister Benjamin Netanyahu said of Hamas. "They're firing missiles at our civilians. They're hiding behind their civilians. That's a double war crime right there." Palestinian parliament member Mustafa Barghouti, however, has called the raids a "war on the Palestinian people" and said the incursion is politically motivated. The armed wing of Hamas, the Izzedine al-Qassam Brigades, said it would continue launching rockets into Israel if "the aggression continues," a masked spokesman said in televised comments. The spokesman said the group had "so far" launched 250 rockets into Israel. Israeli Foreign Ministry spokesman Yigal Palmor called allegations that the boat was deliberately rammed "absurd" and countered that the volunteer vessel was trying to outmaneuver the Israeli boat. Israel has allowed dozens of trucks carrying relief supplies into Gaza. Also, the Rafah border crossing to Egypt was opened temporarily Tuesday to allow aid workers and medical supplies into Gaza and to transport injured Palestinians to hospitals in Al Arish, about 19 miles from the border, Egyptian journalist Shahira Amin said. Doctors in Al Arish said they were treating 36 wounded Palestinians, at least six of whom were critically injured and being transferred to a hospital in Cairo, Egypt, for treatment. CNN's Kevin Flower and Michal Zippori contributed to this report.